I see no shims behind the big bearing, number 92045-1130 , 6908C3 in any drawings , is that the one you are referring to? 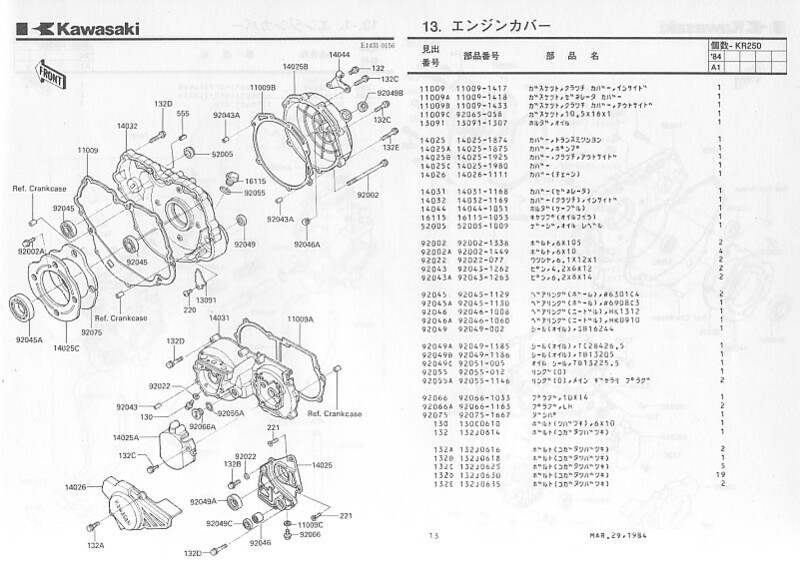 Gerrit wrote: Neither my Japanese nor my English manual has a cross-section drawing of the cutch gear and clutch assembly unfortunately, but I suspect that there may be a shim missing behind the clutch gear. The two 92022-1620 shims are 28.3 x 42 x 1.5 mm, the 92022-1607 is 28.3 x 36 x 1.4 mm accordig to the parts catalogues. I leave it to those with superior knowledge of the tandem engine to advise further. I looked into the 92022 shims a little more, it seems they are located behind the main drive gear, as shown in the drawing highlighted by the red arrows, I need something front of the main gear between it and the clutch basket, see the blue circle, I think I'll machine a spacer to go there to hold the basket away to keep it from rubbing on the inner engine cover. I took the inner cover off ,the spacer I made did not help. I found 92022 and 490A missing on the #8 drawing . The 92022A's were there but I am not sure they are oem or somebodies bodge.Also the large bearing, #92045-1130 was not "home" , that caused the basket to touch the inner cover, I pressed it in. 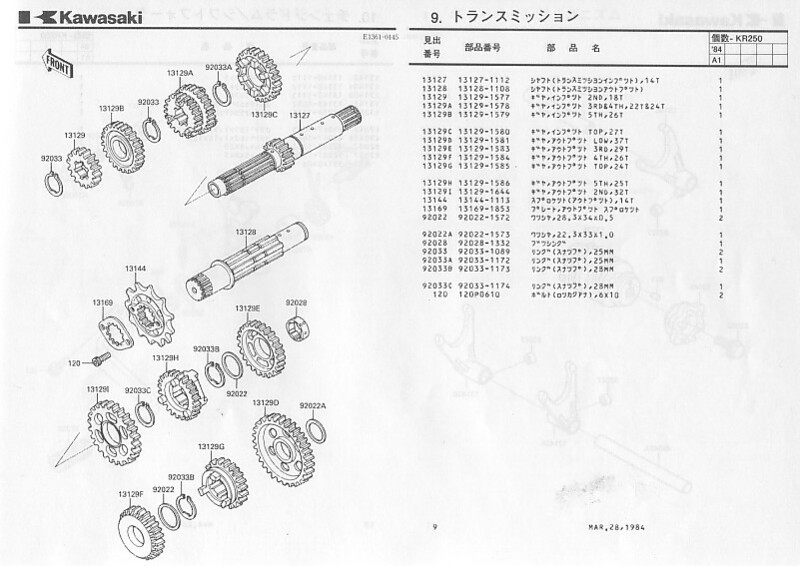 Neither my Japanese nor my English manual has a cross-section drawing of the cutch gear and clutch assembly unfortunately, but I suspect that there may be a shim missing behind the clutch gear. The two 92022-1620 shims are 28.3 x 42 x 1.5 mm, the 92022-1607 is 28.3 x 36 x 1.4 mm accordig to the parts catalogues. I leave it to those with superior knowledge of the tandem engine to advise further. Bear in mind that the original shims are hardened steel. It might be best to order them from your friendly Kawasaki dealer, they may be common to other Kawasaki models. The circlip is probably a standard one, but I'm not sure whether US hardware stores will have metric circips so your friendly Kawasaki dealer may be your best bet. By the way, there's a 13096-1075 clutch housing for sale on eBay in Australia if you still need a clutch housing. It's the part number for the A2 but should work on the A1. One or more shims missing was the only logical explanation to me, so I won't be shot for a wrong diagnosis . Anyway, you've found the cause and know what the solution is. The shims are not available it seems so I will machine some, they are not too thin so they should be OK. There shouldn't be a lot of thrust I would think. I guess I could make a science project out of it and try to harden them. I've hardened custom-made steel parts (emergency repairs) so it can be done. Heat the part until cherry red, then quench in oil. The shims are rather thin though so they may warp a bit. You might be able to find the shims on eBay or beg, steal or borrow them from a forum member who has a few spares lying around. I can get these, I will grind the OD for the #92022 shim, and ID is a little off but they should work. According to my parts catalogue (purple cover) for the A2 92022-1573 is a shim on the output shaft. I don't have a KR250A but going by the parts catalogues I have, there should be a shim on the outside of the input ball bearing (92022-1620), then a circlip, another shim (92022-1620) followed by shim 92022-1607. Next comes a bush (92046-1122), the clutch gear slides over the bush. Next comes the clutch assembly. No sign of any seal whatsoever. I'll dig out my shop manual to see if I can find anything further. Heres another clutch question, the clutch cover actuator spindle acts against a nice bearing assembly with a short shaft . It seems the short shaft would need a steel button of some sorts, it just seems like there is a part missing. There is no mention of it or nothing that shows in the parts drawings. Heres some photos. This looks very much like the KR1/KR1-S actuator arrangement and they don't have anything else there either, so I'd say you're OK in this respect. You're definitely NOT OK with the shims and circlip though. Sure that that isn't what's left of the circlip? found the snap ring in the gasket pocket now the next question ,why did they become dislodged? Yikes!!! One wonders whether that circlip was reused and overstressed- I always replace circlips after removing them. I consider it false economy to use them more than once. All I can say is: be glad those bits didn't get jammed between the gears. If the bike were mine I'd give the engine a total teardown to ensure there was no further damage. It's a pain in the you-know-what, but better safe than sorry. And when she's rebuilt you know that everything's as it should be. you know a circlip has a direction ? it can be mounted the right way or the wrong way. they are made by stamping and because of tha, they have e side with sharp edges and a side with rounded edges. the sharp edge must always be placed to the outside (as in the side to which it might be pressed of. sometimes that's inside).